Singapore: The Wild Edition. Get Down & Dirty With These 6 Hidden Nature Activities! What?! Singapore has a wild side? Before thoughts of living like Bear Grylls start creeping into your mind, we are referring to living on the wild(er) side in Singapore – nature activities catered for the adventurous, nature-loving enthusiasts. Sounds like your type of thing? Step out of your comfort zone with these hidden nature activities. Start living on the wild side – Singapore edition. Venture to this unknown nature wonderland hidden off the mainland of Singapore – Chek Jawa’s Wetlands. Take a stroll along the 1km boardwalk to take soak in the wonders of Chek Jawa. For the more adventurous ones, hike to the wetlands to get up close and personal with the plant and marine life. You can actually walk on Chek Jawa Wetlands itself. However, be warned not to walk barefooted. There may be glass and metal litter as well as sea urchins and other marine creatures that may defend themselves in an unpleasant manner. Alternatively, opt for the guided tours for a more in-depth experience at Chek Jawa. Getting there: Chek Jawa is located in Pulau Ubin. Visitors can either walk, cycle or hire a vehicle to get to Chek Jawa. Get downright muddy with this conservation effort of rescuing Horseshoe Crabs that are trapped in abandoned fishing nets at Mandai mudflats. This is perhaps your only chance to touch and see this ancient-mariner which happens to be as old as dinosaurs! Volunteers are trained to properly handle these fascinating creatures. You’ll learn to measure their length, identify their gender and breeding status before releasing them back into the mudflats. A science lesson like no other! This activity occurs once a month so do remember to register online beforehand. Surprisingly, Jurong’s abandoned railway line has yet to be declared as out-of-bounds by the Government, so feel free to go on this one-of-a-kind jungle and tunnel walk. Start at the railway tunnel near Teban Gardens and be treated to a long tunnel walk alongside some old and forgotten landmarks from the railway line. Do take note that it can get slippery, particularly in the tunnels, so remember to put on your anti-slip shoes! You do not need to be like Tarzan to scale trees! Take on Singapore’s first and only treetop obstacle course – Forest Adventure. There are exhilarating obstacles the likes of wobbly logs, flying fox and even a giant swing (so you’ll feel like Tarzan). Unleash your inner jungle beast right here at Forest Adventure. Just a short bumboat ride away, Pulau Ubin is set to whet your appetite for adventure! Enjoy the scenic bike ride deep into Pulau Ubin to immerse yourself in Singapore’s natural wildlife including the Malayan water lizard and wild boars! Alternatively, trek around this rural island to explore the fruit plantations, flourishing mangroves, scenic beaches and much more. Getting there: Take a bumboat from Changi Point Ferry Terminal. Bumboat Fare: $3/person – one way. Maximum 12 passengers. Additional $2 per bicycle. 6. Can we really snorkel at Sisters’ Island? Unbeknownst to many, NParks has designated Sisters’ Island as a marine park, which means that you can actually snorkel and swim here! Expect to see coral reefs, clams, rare species of seahorses and other marine life up close. You can even plant your own coral under The Garden City Fun’s Plant-A-Coral, Seed-A-Reef Programme! Simply donate a minimum of $200 (all funds go to conservation efforts of course!) either as an organisation or individual. Then sit back and watch as your coral grows to a suitable size before being transplanted to the marine park! 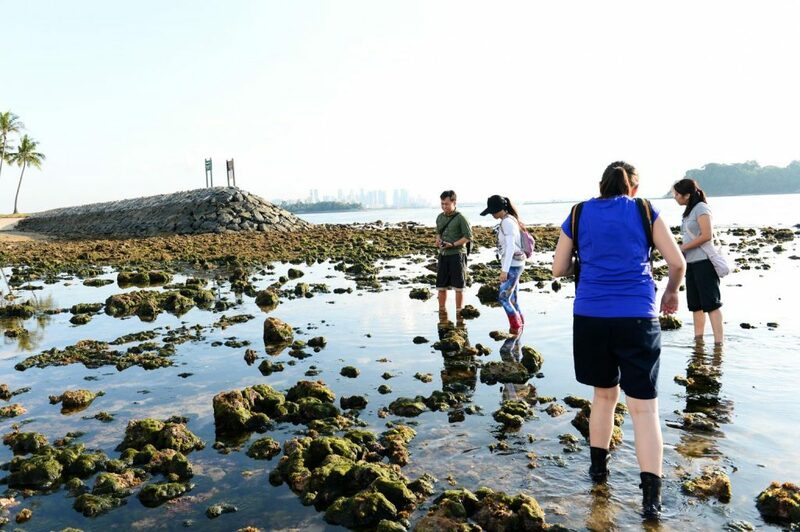 Here at Sisters’ Island, you get to explore and contribute back to marine nature – how much cooler can that get? Getting there: Visitors can charter their own boat from West Coast Pier or Marina South Pier to visit Sister’s Island. Alternatively, join the introductory guided walks organised by NParks. Boats will be chartered for participants of NParks’ guided walks. Escape the hustle and bustle of Singapore’s city life with these wild activities you never knew Singapore had! Get muddy and dirty with Singapore’s wild side. Get your trusty shoes on and get ready to take on Singapore’s wild side! Also, read 15 Must Eat, Must Drink And Must Try Spots In Singapore!